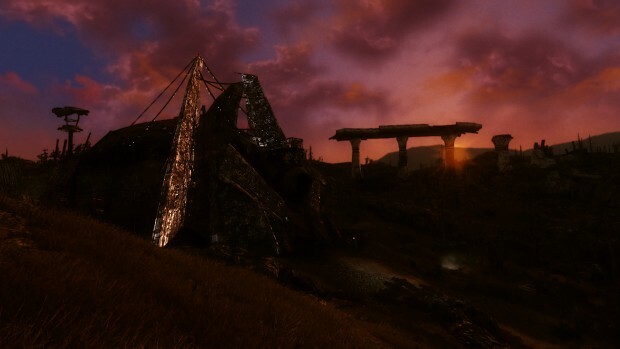 URWLENB FO3 is a weather and lighting color overhaul mod for Fallout 3 and makes the Fallout world beautiful and lighting and colors realistic. It removes the green tint and changes all the colors and lighting, also included is a file that changes interior lighting thouroughly. It adds all new high quality cloudlayers, every single weather has unique clouds and colorscheme. Update v2.0 for Weather for ENB is out ! You can now enable/disable each individual weather in the climate weather cycle, this means that you have total control over the weathers that are chosen by the game in the climate, so you can construct your own climate. The sandstorm/snow/special moods can also be enabled in the normal climate so it gets chosen randomly by the game's weather engine, alternately you can leave the scriptroutine running also to make sure you see these weathers as often as you set them in the frequency menu. you can choose any combination of special weathers in the menu, so you can switch off snow and leave duststorms and rain on, or any other combination you like. don't forget that you can force weathers on the fly with hotkeys, the combinations are Left-Alt + Numpad1, Left-Alt + Numpad2, Left-Alt + Numpad3, Left-Alt + Numpad4, Left-Alt + Numpad5, Left-Alt + Numpad6. I added 4 special moods on top of the 3 already there, also did a indoor clipping fix for ENB. You have to use the included indoor esp for that, so do not use some other indoor lighting mod if you want the clipping fix (other indoor mods aren't really working well with ENB either). Thanks for reading, hope you enjoy the fruits of my labor. Mod Progress and reason for the mod. no conflict, imaginator works fine with the mod, i made it myself with MGE and Gopher so it works ok together. There aren't any different files, it's just one download. And that download has all you need. ENB is a separate thing included in the download, so it doesn't automatically install. You should read the readme file, that helps a lot. Thank you for your hard work creating this mod. I am enjoying it very much in my heavily modded F3, but I have questions. Plus the various extra DLC esp's. My issue is that some interiors 'light up' in sections/flicker? Like in the metro, only the 'chunk' I am inside will be lit properly, the next part of the tunnel will be dark. And some fx like dust/smoke in the air are black, (should be white or grey) or very faint/invisible. Yeah, you use two weather mods together, you can't do that, they both have conflicting forms, and both are scripted, it's just not possible. I (and many other weather mod authors) have said this hundreds if not thousands of times on the internet, you cannot use multiple weather mods together, you just can't, period. Especially these two (meaning URWL and RWL), cause they conflict in hundreds of forms, and have conflicting scripts too. Also, RIL is not so good, i tried it too, it has badly edited Imagespacemodifiers. And lastly, my weather mod is outdated too, i do have a updated version on my onedrive, with Updated ENB, it looks a lot better and has some extra functionality, and some new accompanying esp files, if you want that let me know through a PM, and i'll send you the link. If you want to make another ENB compatible with that version, you should copy the lighting sections (ambient and directional from ENVIRONMENT section) over to your new ENB. The bugs you have are conflicting mods, probably scripted ISM's messing stuff up. 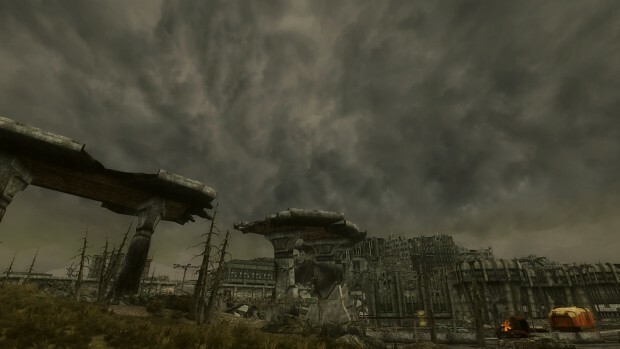 After some testing, I have removed FO3 RWL GOTY - I don't think it was helping my game and agree that I should only use one weather mod. I believe that I had it left over from an older modded F3 and just kept it without thinking. I did run LOOT and it didn't say there were any errors, but I will experiment with removing RWL and using your URWLENB Interiors plugin by itself. i don't know what a jailbroken PS3 is, but as far as i know mods are not possible on a PS3, and on PC you can indeed choose only one weather and lock it indefinitely.